Anyone getting tired of all the white here on my blog??? I've making many big projects the last months, 1 is still not finished and that is Kira's Blanket. 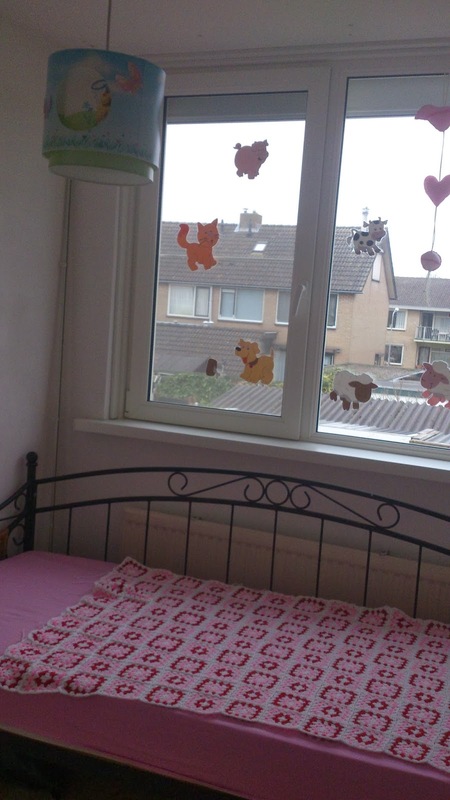 This is a old photo of the blanket, but it's more to show how not girlie Kira's room still was..
She even still had no curtains.. Remember that a few post back, I started with a note NEVER TO SEW CURTAINS again..
Now let me tell you that I bought curtain fabric when Kira was 2 months old, and just last year before Xmas I sewed them.. The reason, I was so afaraid of the big project..
And I can tell you this was the first and the LAST time EVER that i will sew curtain.. I have been frogging so much..
.....became 1 evening of sewing again.. The color on the pic below is the right color off the curtains.. she is loving it so much..
And can you imagine the room only is 2 metre by 2,5 metre, so it's looking even smaller now and very PINK..
but she is loving it!! Here you can see how the blanket is now..
At the right was the blanket already wash so it shrank a bit. so on the left I need to at more to get it in the right size.. 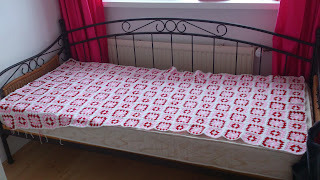 So wanne attach in the front 2 or 3 rows more, and at the top also 1 or 2 more.. then I will wash it before giving it a egde.. I made Kira also a board, but never finished it off. Now she can put her favorite photo's/cards in it and all her pins.. 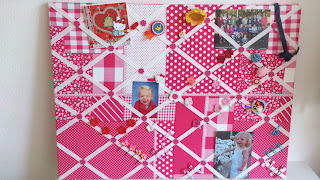 In the years we lost a few..
Oke got another real pink project finished. 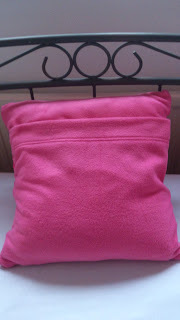 A XL yarn crochet pillow. And after a few hours it was done.. This is made on Hook 10. so a very fast job. All three of her sheeps need to sleep like this every night now..
She has 2 more cuddles, a horse and dog.. I found a XL yarn basket I made a while back, there the horse is sleeping in. And for the dog I;m making a white XL yarn crochet basket.. but that's still a WIP. Kira really can't wait till her birthday. Need to change in my work clothing now.. have a great evening!! 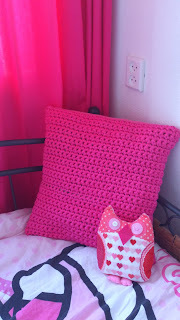 Not only for the pink but for all the great work mamma did :D Wonderful!! How did you do that? Those flower buttons are attatched to the board? Only free space on the white ribbons, correct? What happened with the blanket, did you wash it with hot water? It's not supposed to shrink.. should we only wash those kind of blankets with cold water?! really, 2m x 2,5 ? 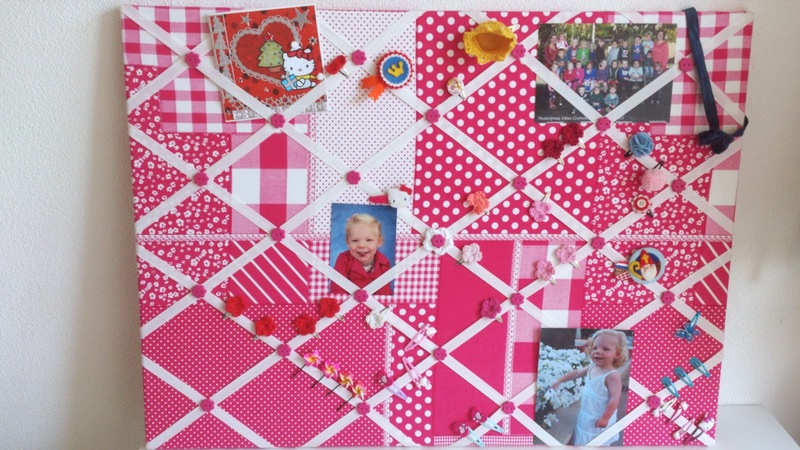 this memoboard is so beautiful ! Wat leuk allemaal Annette, je bent maar druk. 2014 is heel goed begonnen. Valentine's Day is coming so it's appropriate to be "in the pink". Love all the variety of projects. 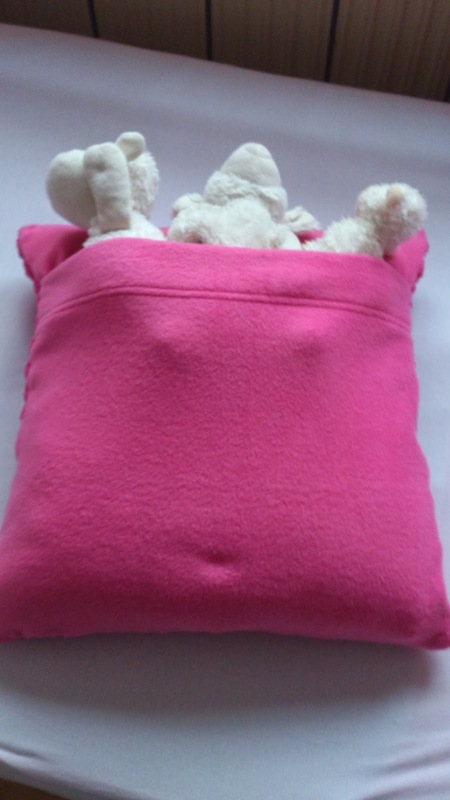 So cute to have a pocket for the animals in the pillow! 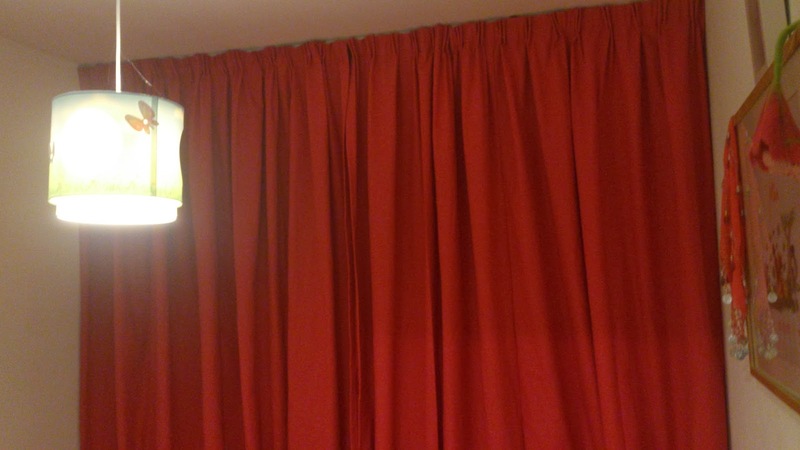 The curtains look very beautiful !! 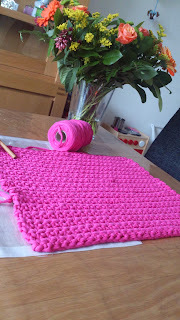 I can understand how frustrating it is to spend more time in frogging than in making. 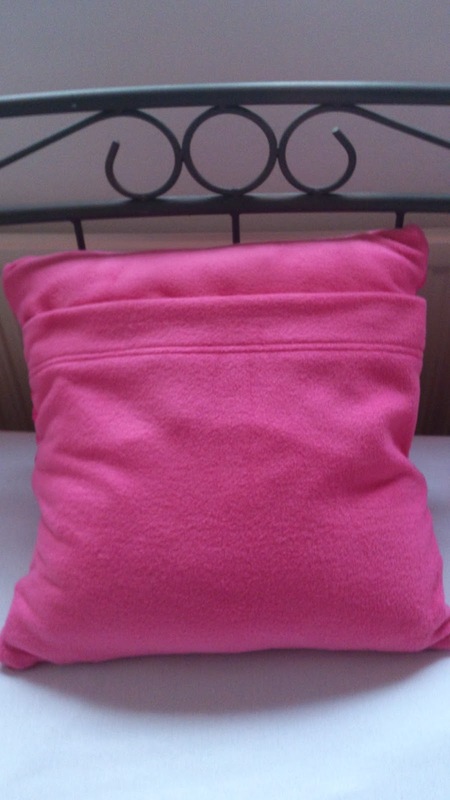 I love the pink cushion and you have done the back so neatly !! Hope you get the right shape for the blanket, it looks very pretty:) I haven't yet taken a plunge in blanket making. I always find it as an intimidating task. Het is wel een heel leuk kamertje geworden! That memo board is awesome--sure to be filled with all of Kira's favorite memories as she gets older! You did a beautiful job on it. And the photo of her three sheep in the pillow is adorable! OMG you are really creative Annette! I understand why Kira is so happy with her bedroom! Small but really beautiful! The curtains, it may give a lot of work but they are perfect! And it's how whe learn to do things, just never give up, next time will be easier! The pillow is really a perfect match for the curtains! wow! You're such a super crafty mommy! The curtains looks great, sorry though about the frogging. Heel mooi kamertje, knap werk. Loved the memoboard!! I think its a great idea for Kira! For her to put pictures and things that she likes over the years and save it all there...loved it! !